At age 52, Maria Sibylla Merian undertook a hazardous three-month voyage to the Dutch colony of Suriname in South America. Her drawings and watercolors of the country’s exotic flora and fauna were reproduced as engravings on her return to Holland two years later. Her studies of insects in their natural habitats contributed to the 18th century’s comprehension of metamorphosis, which had been misunderstood since antiquity. 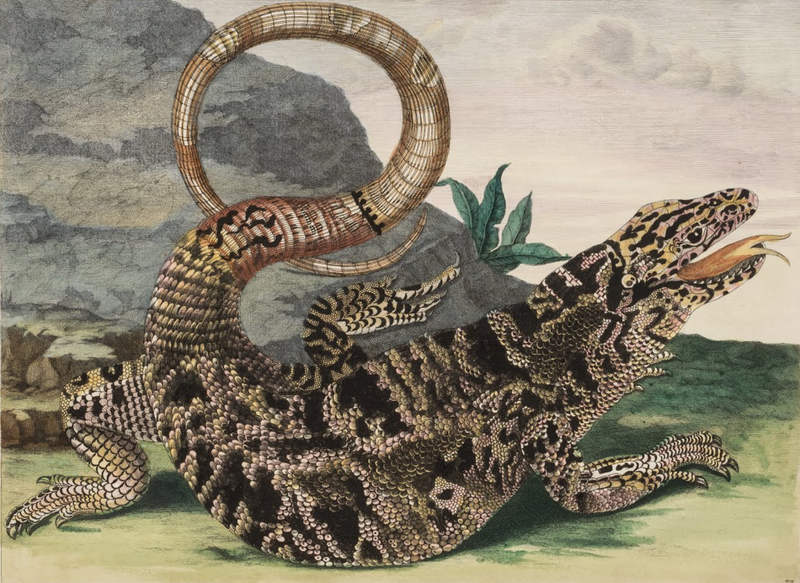 While in Suriname, Merian used her artistic and observational skills to record creatures, such as this reptile as well. She portrayed its distinctive, intricate patterns of scales with the same precision she brought to insects. The dynamic, elegant loop of its tail adds compositional interest and a baroque flourish. This engraving is one of 82 that were based on Merian’s meticulous sketches and field notes and appeared in her lavishly illustrated publication.